In a large bowl, combine peach slices and lemon juice. Set aside. In a medium bowl, whisk together the brown sugar, vanilla bean seeds, ground cardamom, cornstarch, and salt. Sprinkle over the peaches and mix until evenly coated. Set aside once more. On a lightly floured surface, roll out half of the chilled pie crust dough into a 14-inch round. Wrap dough lightly around rolling pin and transfer to a 9-inch pie pan. Gently press dough into the bottom and sides of the pan. Trim the dough to allow a 1-inch overhang. Add the pie filling. Preheat oven to 375 degrees F (191 degrees C). With the remaining dough, roll it out into a rectangle, keeping the thickness the same as the bottom crust. Using a pizza cutter, or a long knife, cut the dough into 1-inch thick strips and arrange in a lattice pattern on top of the pie (Deb at Smitten Kitchen has an excellent tutorial on how to create a lattice pattern if you are unsure where to begin. Do check this out!). Cut off any excess from the strips and pinch together the top and bottom pie dough between your thumb and forefinger to make a sealed edge around the rim. Brush the pie crust with the heavy cream and sprinkle on the granulated sugar. Bake the pie for 50-60 minutes, or until the pie crust is browned and the fruit is bubbly. If the pie crust should brown before the pie is finished baking, cover the edges with aluminum foil to prevent further browning. Remove the pie from the oven and allow to cool for 2-3 hours before cutting into it. 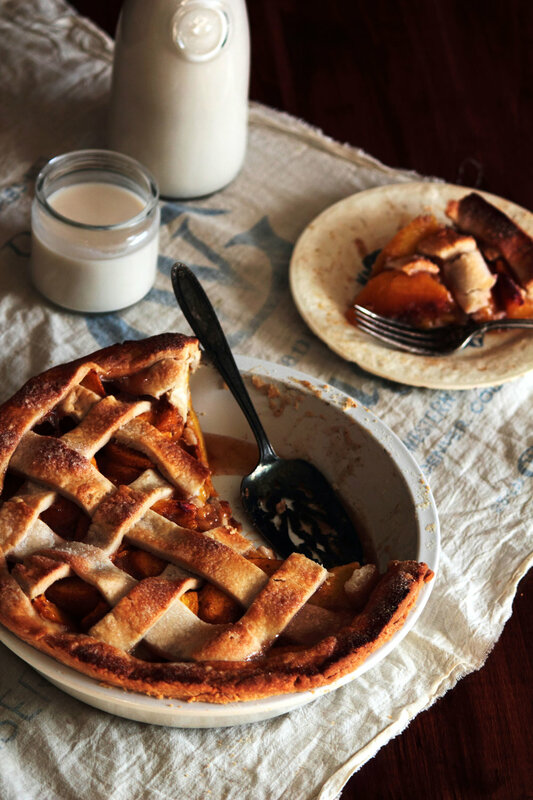 The pie needs a long time to cool down and it cuts best near room temperature when the juice from the peaches thickens. Serve with a dollop of whipped cream, a scoop of vanilla ice cream, or simply on its own.